Hardback. Criminology Studies Volume 3 (in the continuing series). 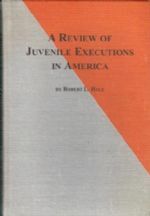 A comprehensive study of the capital punishment of juveniles in the USA, which combines a number of approaches. Among these are sociology, history, political science, legal philosophy, and even religion. The author has linked these areas to provide an understanding that executions do not occur in a vacuum, but are influenced by a number of outside factors. This study weaves together not only who was executed at any given time, but links these executions to other influences that were taking place, and goes on to show how these executions could only take place because of the coming together of these seemingly unrelated events. Tables of Contents includes : List of Tables, List of Figures, Capital Punishment in America, Data and Methods, Colonial America and Capital Punishment Practice, The Face of Change, The Rise of a Nation, The Progress Period, The "Evolving Standard of Decency" in the Modern Era. With Appendix (Capital Offenses, By State, 1992), Notes, References, Cases Cited and Index. 144pp. 8vo. h/back. From the library of true crime writer, Wilfred Gregg, with his personal b/plate. Dust jacket not required. F.